Marriott’s OceanWatch Villas at Grande Dunes associates are presented with the inaugural CMN Hospitals Legacy Award in recognition of their engagement and fundraising successes in 2017, benefiting McLeod Children’s Hospital in Florence, South Carolina. 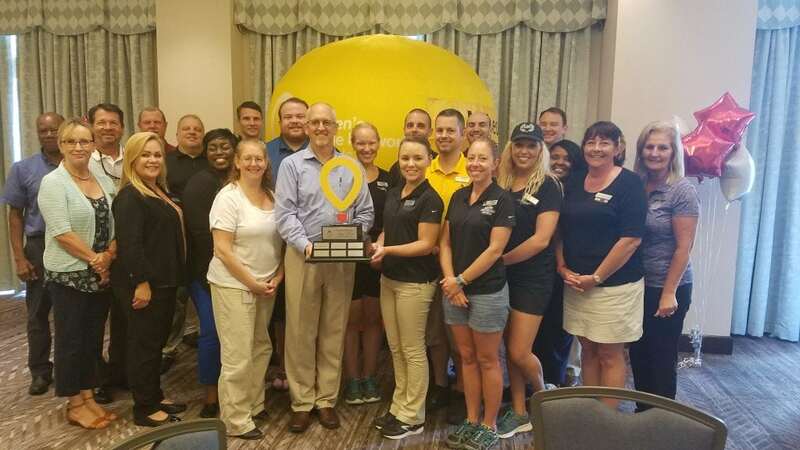 The OceanWatch team began to gather momentum in 2016, when the resort’s general manager, Paul Bishop, and the resort management team made the decision to become a part of MVW’s Torch Relay event to benefit CMN Hospitals. Unfortunately, Hurricane Matthew hit two days before the scheduled event and it was cancelled. Having raised more than $30,000 in 2016 for the Torch Relay event, the team was determined, more than ever, to increase their fundraising and enjoy the Torch Relay event in 2017. The OceanWatch team exceeded expectations and surpassed goals, hosting successful events throughout the year. Leading up to the resort’s signature fundraising events which include the CMN Hospitals Bratfest, July 4th Carnival and Torch Relay, the team hosted wristband, balloon and bake sales to raise even more money for the kids. In addition to the fundraising, Paul Bishop took the team to their local CMN Hospital, McLeod Children’s Hospital, to better understand the immediate needs for funding. The team was able to talk to the hospital staff about their needs and see firsthand why their fundraising was so important. During that visit, the resort team asked the staff what the hospital could achieve with their donation, if the team could reach their goal of raising $40,000. The staff said they desperately needed additional Accuvein Viewers. They were using one for the entire hospital and needed many more. This device allows McLeod’s healthcare providers to scan a patient’s skin to easily find a ‘good’ vein for a needle stick. The device reduces pain and ensures only one needle stick is necessary – improving care for the babies, kids and teenagers treated in the hospital. At $5,000 per device, this was no small goal! 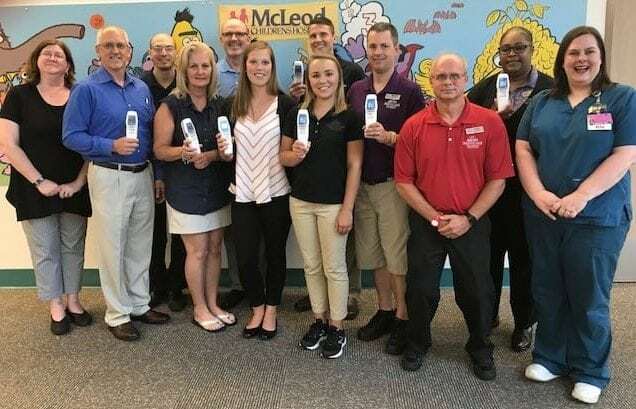 OceanWatch associates pictured at McLeod Children’s Hospital with the seven new Accuvein Viewers the hospital had purchased thanks to funds raised by the resort team, guests and Owners in 2017. With newfound determination, the team at OceanWatch was able to surpass their prior year contributions by 62%! They set a record for the East Region of $55,159 and contributed $.49 per occupied key. This was the highest production of any resort of over 200 units. Using weekly updates, local contest and layering the CMN Hospitals message into everyday conversations, Paul and his leadership team were able to stay focused on giving guests a great vacation experience while finding ways to participate in the fundraising efforts together. Some of the team had the chance to visit McLeod Children’s Hospital recently. The hospital staff surprised OceanWatch associates by showing the SEVEN new Accuvein Viewers they were able to purchase with the funds the team had raised! The funds raised by OceanWatch make Marriott Vacations Worldwide the second largest CMN Hospitals partner for McLeod Children’s Hospital. The OceanWatch team has been off to a great start in 2018 to continue their impact on local kids, raising over $13,000 in the first two quarters. This resort has not only solidified their commitment to kids and families in their community, but they are also committed to maximizing their guests’ and Owners’ vacation experiences while doing so. Providing fun, engaging and memorable activities while empowering guests and Owners to give back is what makes OceanWatch so successful in their efforts. Congratulations to the team at Marriott’s OceanWatch Villas on this well-deserved award!